Early this morning, the folks at Camaro5 brought us the first bit of information of the Camaro expected to be called the next Z/28 but around 10:15am EST, General Motors officially unveiled the supercharged 2012 Chevrolet Camaro ZL1. Spyshooters around the world had previously caught the high performance, supercharged Camaro testing in varying levels of figure-hiding camouflage and the majority of the performance car universe assumed that we were looking at preproduction “mules” of the next Camaro Z/28. This morning, we all got a pleasant surprise when it was discovered that the supercharged 2012 Chevrolet Camaro will instead bring back the vintage ZL1 moniker. The original Camaro ZL1 was introduced in 1969 with a 427 cubic inch big block Chevy engine and additional modifications intended to make the car ideal for racing and the 2012 Camaro ZL1 follows a similar line of thinking. Like the original, the 2012 Camaro ZL1 is based around a high performance engine option but as opposed to be massive 427 from 1969, the 2012 Camaro ZL1 is powered by the same 6.2L supercharged LSA V8 found in the Cadillac CTS-V sedan, wagon and coupe. The supercharged LSA V8 makes 556 horsepower in the Cadillac application and while today’s announcement states that it will make 550hp in the Camaro ZL1, it should be pointed out that Chevrolet refers to this figure as an estimated number. When the Camaro ZL1 reaches showrooms in early 2012, the actual output could be 550 horsepower or it could be higher – but don’t expect it to be any lower than that figure. In any case, offering around 550 horsepower makes this the most powerful production Camaro ever offered based on official power ratings. The exhaust of the Camaro ZL1’s supercharged V8 utilizes a special dual-mode setup that controls and alters the sound levels of the exhaust system depending on engine RPM. That way, when you are idling through a quiet neighborhood, the ZL1 maintains a low profile but when you open it up on the open road – it makes its presence known as full volume. This setup was originally used on the C6 Corvette and the Camaro ZL1’s exhaust has been tuned specially for this high performance setup. 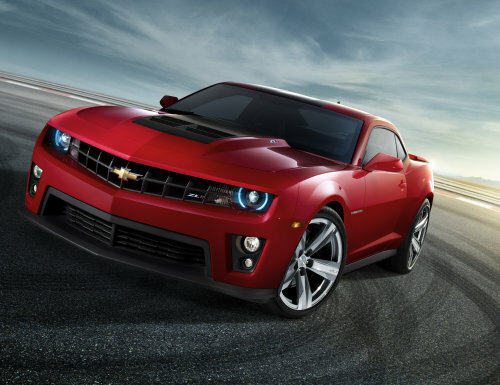 The power of the 2012 Chevrolet Camaro ZL1 is sent to the 20” lightweight aluminum rear wheels wrapped in high performance Goodyear rubber by means of a Tremec TR-6060 6-speed manual transmission. A dual mass flywheel and twin disc clutch help the transmission harness all of those ponies and this special “MG9” version of the Tremec transmission is designed specifically to work with the LSA V8. A short-throw shifter specific to the new Camaro ZL1 helps the driver get through the gears as quickly and smoothly as possible. In order to ensure that the 2012 Chevrolet Camaro ZL1 handles as well as it accelerates, General Motors has equipped it with a massive set of Brembo brakes in the front and rear, coupled with a fully revised suspension system that features the Magnetic Ride Control system from the Corvette ZR-1. This system comes with Tour and Sport modes, allowing for the best possible ride quality during normal daily driving while also featuring unprecedented handling capacities on the race track. This suspension setup should make the 2012 Camaro ZL1 the best-handling Camaro ever – if not the best-handling muscle car of all time. Finally, the 2012 Chevrolet Camaro ZL1 features an exterior look that makes it very unique from the non-ZL1 Camaros while also being fully functional. The front fascia is far more aggressive, with the foglight housing also serving as a cooling duct for the high performance Brembo brakes and along the front end, the lower fascia opening allows for plenty of air to help keep the 550+ powerplant cool and breathing easily. The massive cowl induction style hood includes a fiber carbon center section painted black, with integrated air extractors that pull hot air from the engine bay and channel it over the car to improve downforce. Along the sides of the Camaro ZL1, there are new 20” aluminum wheels with a lightweight design to maximize performance and along the rear end, a new rear fascia makes room for the 4 polished exhaust tips. Chevrolet has shown to debut the car in red with the black center section on the hood but every exterior paint option available on the current Camaro will be available on the 2012 ZL1 when it reaches showrooms next year. In addition to all of the features that make the 2012 Chevrolet Camaro ZL1 so amazing, ZL1 models will also feature all of the standard items included in the current Camaro 2SS with items like a Boston Acoustics premium sound system, power seats, a rear parking camera and the console mounted gauges which, in ZL1 form, includes a factory boost gauge. General Motors is claiming that the 2012 Camaro ZL1 will reach showrooms early next year but you have to wonder what it will cost to get into the most powerful and possibly best-handling Camaro ever built. The supercharged LSA V8 is only available in the 2012 Camaro ZL1 and the Cadillac V-Series lineup – which starts around $64,000. The Magnetic Ride Control System is currently available on the Corvette Grand Sport Corvette Z06 with the Z07 package and the Corvette ZR1, with prices of those vehicles ranging from $55,000 to $111,000. When you add in the price of these high performance features with the rest of the items included in the ZL1 package, I would guess that the price will fall somewhere between the Corvette Grand Sport and the Cadillac CTS-V Coupe; which would put the Camaro ZL1 in the range of $55,000-$65,000…thus locating itself between the least expensive Corvette to use some of this technology and the 2-door Caddy that is powered by the same supercharged LSA V8. You can be sure that as soon as pricing information and official (final) specifications become available, TorqueNews.com will bring you more on the 2012 Chevrolet Camaro ZL1 but in the meantime, enjoy the video and images below, courtesy of GM.